← 1…2…3… Magic!! Christy Clark needs a time out!! So… sometimes my life seems to be cruising along pretty smoothly… and then something goes completely sideways. I am not particularly phased by this; it is one of the things that parenting a child on the Autism spectum has gifted me. I am resilient. It is my super-power! I accept that this is my world, and as I have previously stated, my philosophy tends to be, when the going gets rough… it means there is work to be done! The other thing I know is that when the going gets tough – it is good to do something to help others. Advocacy is its own reward, and focusing out-ward to extend understanding and compassion to others has certain healing properties. Sometimes, however, the sideways things that can catch us all a bit off-guard seem to multiply and hit a kind of critical mass, creating a perfect storm of impossibility (or impassibility). I think I may be there right now – but I have a quiet moment in the storm’s eye – to catch my breath and reflect. Tonight I have driven into The Big City. Tomorrow my Dad is arriving from down south where he winters with my mother. He is not doing so well right now, and I am holding my breath – and bracing myself. I will be there to support him at the hospital when he arrives. He is retired now, but he was a teacher, like me. He and my mother have been politically active, also like me. Advocacy is in my blood! We come from a line of people with strong values, who are willing to stand up for their beliefs. Right now I’d like to respond, “Dad, I think I might be getting a bit too much enjoyment out of life!! !” He would laugh at that! So I have a little video on Youtube. It is a song a wrote a number of years ago, in 2002. I just had to change the Premier’s name and sadly – the rest of the lyrics were still relevant. This was something to keep my mind occupied today, and to further assist in advocating for public education in British Columbia, which is currently under attack by an adversarial Provincial Government. Most of the images in the video were taken by me, but a few of them are photographs taken from the book: Working lives: Vancouver 1886-1986, (Elaine Bernard, 1985). There are two images in the book that are particularly important to me. 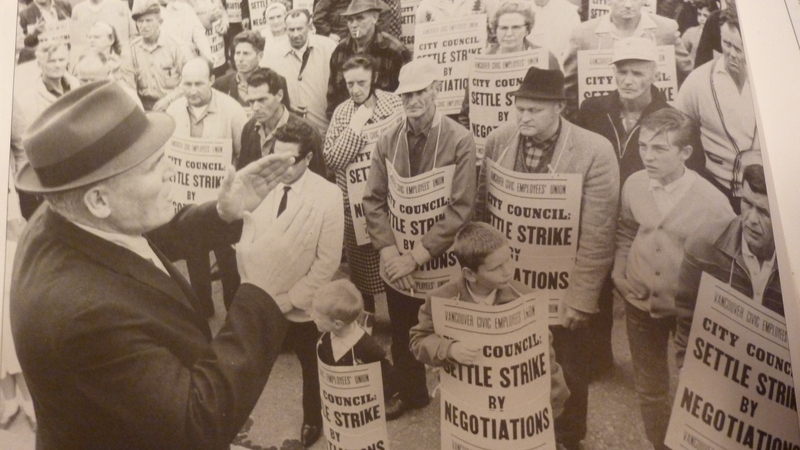 The first is of my Grandfather, Don Guise, speaking to workers during the Vancouver Civic Employee’s Strike, May 12, 1966. 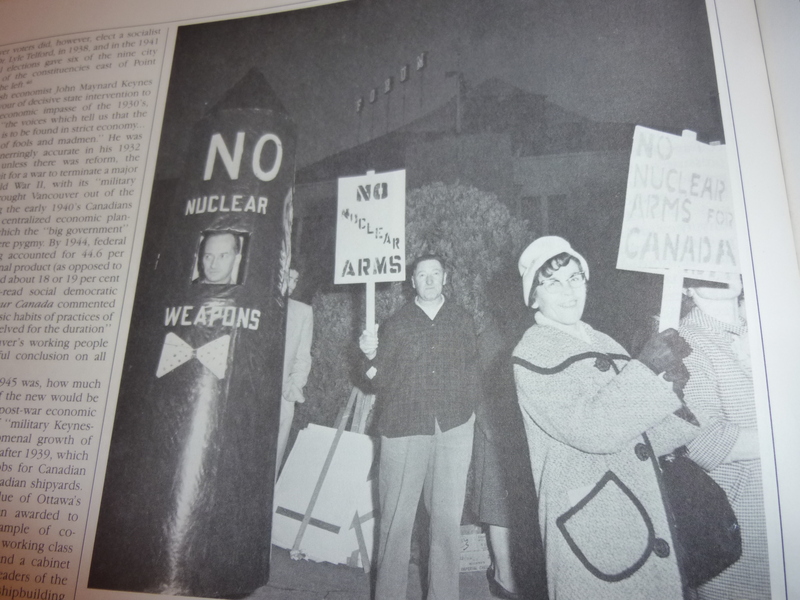 The second is a photo of my Grandmother, Rhea Dear, at an anti-nuclear protest, outside the Pacific National Exhibition in Vancouver in 1963. And finally, here is the link to the song I recorded today, after winning a minor battle with Garage Band. And not to be overlooked for his contribution and technical finesse, a huge thank you to my talented musician husband, aka, The Amazing Craig! This entry was posted in Autism, BC Teachers Federation, BCTF, Christy Clark, family, Father, Parent, Public Education, Resiliency, Teacher and tagged advocacy, BC Hydro, Distraction, Elaine Bernard, Folksong, grandparents, hope, hospital, parents, political, resiliency, struggle, teacher, Working lives: Vancouver 1886-1986. Bookmark the permalink. Can I make this go viral? 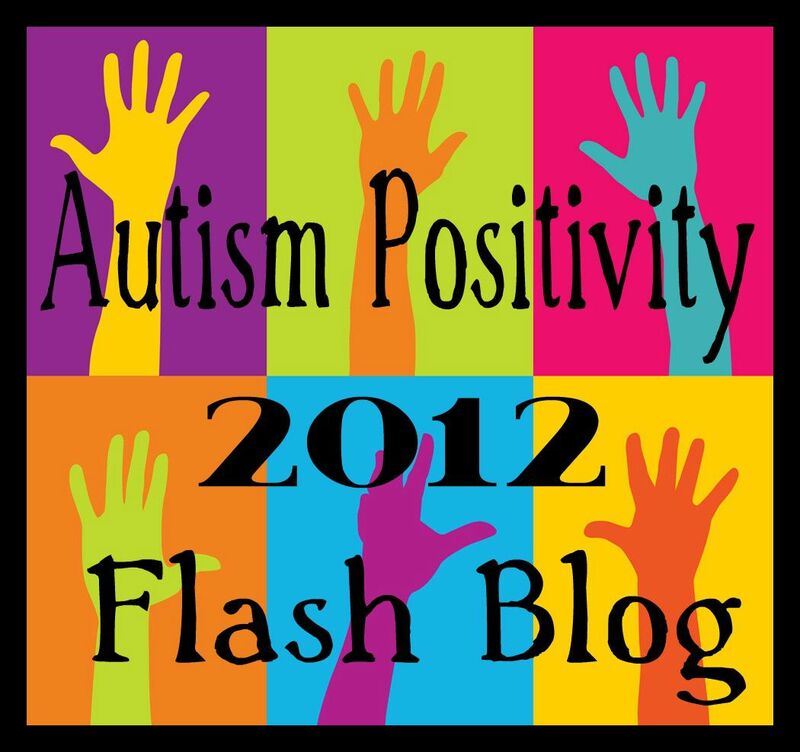 If you have that power, Esther – go ahead and give it all you’ve got!! Thank you 🙂 and Hugs!! Cool video. I’ve been feeling really discouraged about social issues, especially recently. We take two steps forward and three steps back, and it seems like so few people care. Maybe I’m getting a bit too much enjoyment out of life too, like you said. Anyway, this post cheered me up. Thanks for that. Thank you so much! You cheered me as well! I very much appreciate your comment and your support!